“A full master of the epic fantasy.”—Tulsa WorldOne of the world’s most acclaimed fantasists, New York Times bestselling author Robin Hobb returns to the world of her popular “Tawny Man” trilogy with Dragon Haven—the second book, following Dragon Keeper (“Imaginative, literate, and compassionate from first page to last” —Booklist) in an epic adventure about the resurgence of dragons in a world that both needs and fears them. 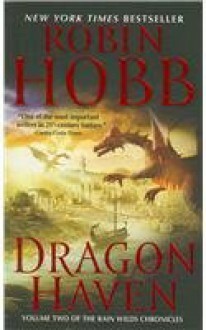 Hobb, whose Soldier Son Trilogy (Shaman’s Crossing, Forest Mage, Renegade’s Magic) has won raves from critics, fans, and peers alike, returns to the Rain Wilds with Dragon Haven, and readers of Raymond Feist, Terry Brooks, and Lois McMaster Bujold will eagerly follow. http://rameau.booklikes.com rameau's ramblings 1.0 Yeah, nope.